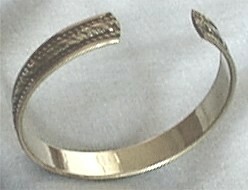 Elegantly Inlaid Copper and Brass Bracelet. Made with an Intricated Pattern of Interlaid Copper and Brass and Equally Well Finished on The Inside as Well as on the Outside, This Bracelet Emulates the Quality of Workmanship and Design That's Normally Found in Precious Jewelry. Economical, Stylish and Elegant, It Can Be Easily Adjusted to Fit Snug on Any Wrist Size. Copper is in Style. It's Also Believed That it Helps in Soothing or Preventing Arthritis Pain. Brass Contains Copper and Zinc, Two Essential Minerals for the Human Body. The Bracelet is Appx. 7/16" Deep, Almost 2 1/2" High and 2 & 1/2" Wide. It Can be Opened to Almost 3". To Fit Larger Wrists.